The 21st Web3D Conference will be held in Anaheim, California, USA. This year’s theme “3D for All” focuses on new research and applications of 3D technology in emerging, alternative, or under explored fields, such as medicine, education, and geographical information systems. Share and explore methods of using, enhancing and creating new 3D Web and Multimedia technologies such, X3D, WebGL, HTML5, Flash/ Stage 3D, X3DOM, COLLADA, and the MPEG family. The conference highlights capabilities and trends in interactive 3D graphics across a wide range of applications and supports research from mobile devices up to high-end immersive environments. 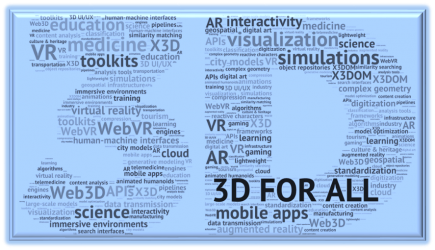 This year’s theme “3D for All” focuses on new research and applications of 3D technology in emerging, alternative, or under explored fields, such as medicine, education, and geographical information systems. The final Web3D 2016 conference program is online and totally impressive. Please register and join us there! Anaheim, CA. US. anita.havele Requirements, Proposals and Strategies for extensions to X3D to enable further adoption of X3D.